Sapphire/LumiBrite Teeth Whitening - Rose L. Wang, D.M.D. If you’re looking for a whiter and brighter smile, it’s time to step into Rose Dental at Nashua NH. With both in-office and at-home teeth whitening options, Rose Dental is able to offer convenient solutions to ensure that your smile dazzles like never before. So don’t let stained teeth be the first impression someone has of you. Whiten your smile today to have that classy, luminous smile you’ve always wanted. What is the difference between the Sapphire professional teeth whitening system and the LumiBright system? The Sapphire tooth whitening system is done in the dental office and can typically takes only an hour. LumiBright, on the other hand, is an at-home teeth whitening system that typically takes 1-2 weeks to complete. Teeth can become discolored or stained for a variety of reasons. Most commonly, teeth become discolored as a result of growing older or consuming certain foods, such as coffee or tea. Teeth are also stained as a result of smoking. The whitening gel used in these systems contains hydrogen peroxide. As it is broken down, oxygen enters the enamel and dentin, which bleaches any colored substance. But don’t worry! This chemical reaction does not change the structure of the tooth in any way. The in-office whitening system can make your teeth up to 8 shades whiter, while the LumiBright system can increase whiteness by up to 9 shades! 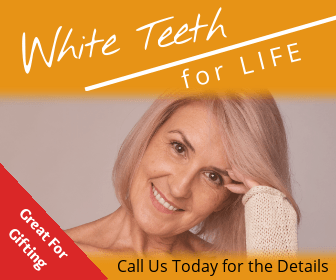 How long will my teeth stay white for after using the Sapphire or LumiBright tooth whitening system? While these systems can significantly whiten your teeth, they will not prevent future stains from occurring. To maximize the longevity of the results, we suggest clients follow up with post-whitening habits, including a touch-up 12-16 months after the first session, daily flossing, and brushing teeth twice a day with whitening toothpaste. No. Neither tooth whitening systems cause any pain, though some patients may have increased tooth sensitivity that typically lasts for 1-3 days following the in-office procedure. Am I the right fit to use these systems? All patients interested in the tooth whitening systems will be assessed prior to any procedure to determine whether or not they are right for the systems. Additionally, we do not recommend tooth whitening for children under the age of 13 nor pregnant women.